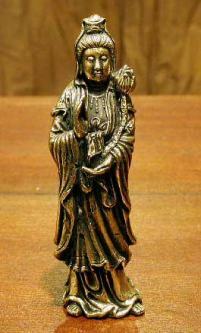 Sorry, we are currently sold out of 'Black Stone Kuan Yin Statue on Lotus, 14 Inches'. Please click the Wait List link below and you will be notified when it is back in stock. These Kuan Yin Statue stand 14 inches tall and are made of Black Sand Stone, and they depict the Goddess Kuan Yin standing on a lotus blossom. This Black Kuan Yin Statue holds a pearl in her right hand, a symbol for purity, and in her left arm she holds a willow branch. This stone Kuan Yin can be used indoors or out. Most people like to put them in their gardens though, since the stone finish of this statue makes it look almost like a smaller version of a temple statue.